HARWELL, United Kingdom — A 99 million pound ($132 million) satellite test facility to be built at the U.K.’s Harwell Campus should bring more business to the space hub here and ensure Britain’s satellite manufacturers can carry on without disruption post-Brexit, according to Chris Mutlow, director of RAL Space, the space division of the U.K. state-run Rutherford Appleton Laboratory. RAL Space currently runs a smaller test facility in Harwell that can accommodate satellites as large as 3.5 metric tons. The facility mostly supports governmental and academia-led projects, said Mutlow. 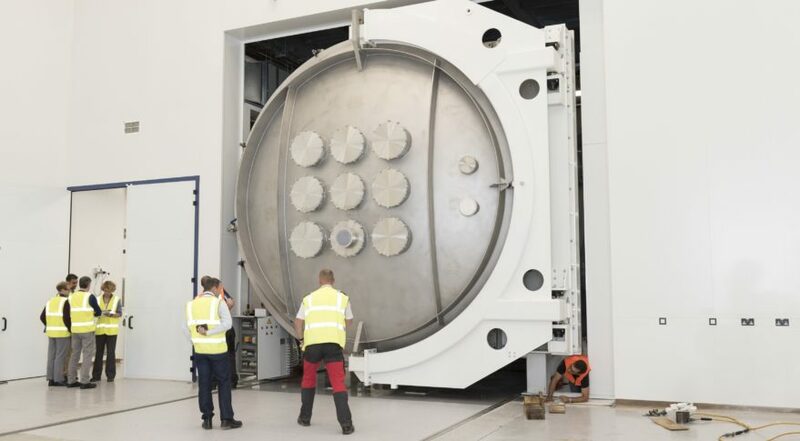 In August, RAL Space installed a second thermal vacuum chamber measuring 5 meters in diameter and 6 meters long. The new facility will have a vacuum chamber 8 meters in diameter and 12 meters long, according to Sean Stewart, RAL Space program manager. RAL also operates several smaller thermal vacuum chambers at its Harwell facilities. The new facility, to be opened in late 2020 according to the current plan, will compete with the other three large-scale satellite test facilities in Europe: ESA’s European Space Research and Technology Centre (ESTEC) in Noordwijk, the Netherlands; the Intespace Test Center in Toulouse, owned jointly by Airbus and Thales Alenia Space; and the IABG test center in Munich, Germany. According to Mutlow, the workload experienced in Europe’s existing facilities is already high and new capacity is needed to accommodate the expected growth of the sector. A U.K. Space Agency space facilities review led the government to identify the need for more domestic test facilities, and in particular, a “one stop shop” for assembly, integration and testing helping manufacturers to avoid the expense and risk of having to move a spacecraft around during this process. With the pending 2019 withdrawal of the U.K. from the European Union, U.K.-based satellite manufacturers might face further complications when moving their spacecraft abroad. Although the negotiations between the U.K. and the EU produced first results last week when the two parties agreed on several points — including ensuring some rights of EU citizens living the U.K. and U.K. citizens in the EU — it is still unclear what the trade arrangements will be once the U.K. departs from the European bloc. The funding for the facility, announced in July, comes from the Industrial Strategy Challenge Fund, which aims to boost tech industries that promise future growth and improve cooperation between businesses and academia. The U.K. has an ambitious plan to control 10 percent of the global space economy by 2030. In 2015, the U.K. space sector made up about 6.5 percent of the global space business, according to the U.K. Space Agency’s Size and Health Report of the U.K. Space Industry, published in December 2016. According to Stewart, construction of the new facility is expected to commence in October 2018 with operations set to begin in late 2020. In February this year, the U.K. Space Agency invited consortia of prospective spaceport operators and launch vehicle providers to bid for funding to help them commence satellite launch services in the U.K. by 2020. According to Ross James, deputy CEO and director of commercial space at the U.K. Space Agency, the agency is currently finalizing the evaluation of the bidders and will announce successful candidates early next year.